The lightest stripes are actually white, but picture taken late at night...will try for an outdoor shot later and add it. 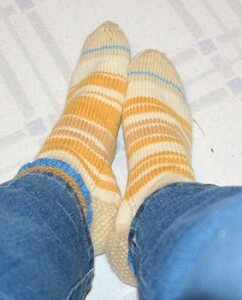 This is the 40th pair of socks I've knit, from the night I cast on the first one, January 28, 2012. I've learned a lot. I'm still learning. This pair has mostly Cascade 220 and Cascade 220 Superwash yarns in it, but the blue stripe at the top and the lighter blue stripe at the toe are both Bernat Sesame yarns from my mother's stash. The brighter yellow-gold (the Cascade 220 Superwash yarn) was purchased for socks for my son, but it turned out he wasn't that interested. The slightly darker caramel color stripes were on sale as a dyeing error and I thought the color looked "interesting." I still think it looks interesting and it will be used again. The yarn ends are still shaggy inside--not yet woven in--because I wanted a picture of them right after getting the toes together. Boosts my spirits. Of the 40 pairs I've knitted, 3 were custom knit for friends, and one pair knit for myself was given to another friend for her husband to try on, and ended up going home with her daughter. A number have worn out. This is the 10th pair of shorty socks (all still whole) and there are 19 left in service of the 26 regular pairs knitted and kept for myself. Pairs completed this year (including 2 pair started last year): 6 regular, 3 shorty. 4 pairs of regular socks (1 for friend) and all the shorty pairs were begun and finished so far this year. I need to keep up the pace, as some of the oldest socks are at or over their durability limit. Very pretty - really like this collection of colours. 40 pairs of socks in that time period sounds like quote an accomplishment to me. I'm alternately amazed that I've done that many and amazed that it took this long--but I'm not a fast knitter and do have books to write. Thanks. That was my hope, but they gave me some serious challenges on the way there.